F. meleagris bears little resemblance to F. imperialis. Bulbs and foliage are odorless. 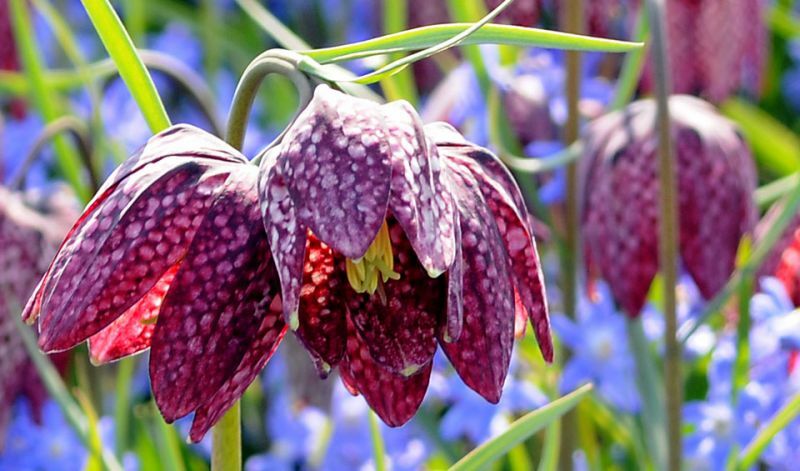 These fritillarias are usually sold as mixed colors; shades of purple and white. Ocassionally you may find the lovely white variety 'Alba' available for sale. The species is native to Europe where bulbs usually grow in very moist locations. Add upgraded black peat to improve your soil for better conditions and don't disturb the plants for best results. Create an ideal situation by introducing sphagnum peat between the plants to allow seeds to germinate. In borders, rock gardens, lawns, under trees and shrubs, and perennial beds. Allow the foliage to die down on its own and it will form seed pods and self-sow. (Besides the species itself); 'Alba' (white).